The present and past name of the barangay is Faraon. The following is the story about its origin. Long time ago, a village named LUNAS was inhabited the by superstitious and diwatanos people. They were all illiterates. One day, the councilor of the town of Jagna was sent by the Alcalde to organize the village into a barrio. Before naming the barrio, the Councilor told a story about the king of Egypt. He said that the people of Egypt were ruled by the Pharaoh ( Faraon ). 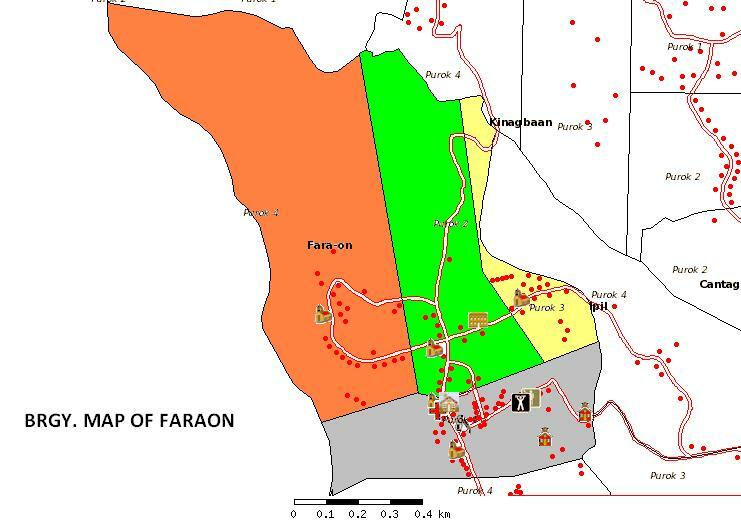 Before anybody could suggest the name of the barrio, Mariano Bagaipo suggested that the newly – created barangay be named Faraon derived from the BIBLICAL king of Egypt. Lunas until now remains a sitio although the name had been changed to Lumad. The other sitios of the barangay are Tana-an now Tina-an – because women in this place are actively involved in “saguran” weaving at the same time applying with the daora color which is red when dried,. Libjo, a sitio once inhabited by progressive farmers but is now depopulated due to lack of water in the area. Dansalan / Dansuli was discovered by Valentin Cagas. Rupatag, which means “plain place” because of etymology “patag” and the prefix “ru” coined by then Teniente Rosendo Virtudazo who, resided in the place. Then Katande, which was eventually merged with sitio Lumad and Luc-an, a secluded sitio geographically, situated on an elevated place thereby allowing the residents to see the beauty and grandeur of Mother Nature. Luc-an now is not a sitio anymore. Barangay Faraon was organized and established in the year 1890 during the Spanish regime.The original family – residents were the Bagaipo, Acdal, Cagampang, Acebu and Virtudazo. The residents of Barangay Faraon envision a totally developed community, wherein the people therein are God fearing other-centered and stewards of the environment.Wherein the people are cooperative to the call of duty, healthy both in mind and body, peace advocates and living a life with dignity and honor. Every individual resident in the barangay plays a very vital role toward its development coupled by the strong support of the barangay council. The local government unit, gov’t agencies, non government organization, and the people’s organization. With such dynamic cooperation, the fulfillment of all dreams will be realized in all aspects, economy, agriculture, environment, education, culture and art, infrastructure and development administration.